The “Soirée”, in a trendy “quartier” of Soho, London was held to celebrate the 10th anniversary of “AnOther” magazine by it’s editor Jefferson Hack – ex-boyfriend of Kate Moss and father of her daughter Lily Grace. Sponsored by Swarovski, and co-hosted by Kate and actress Tilda Swinton, it was a huge occasion of hype and extravagance – champagne and vodka were flowing – and the “crème de la crème ” of rock celebrities, as well as icons of the London fashion world gathered to celebrate. Kate Moss, with her partner Jamie Hince, arrived at the venue looking stunning in a brilliant, sheer green creation, which suited her newly darkened hair to perfection. As usual, she stole the show. Something about this girl… beautiful, magnificent, enigmatic. 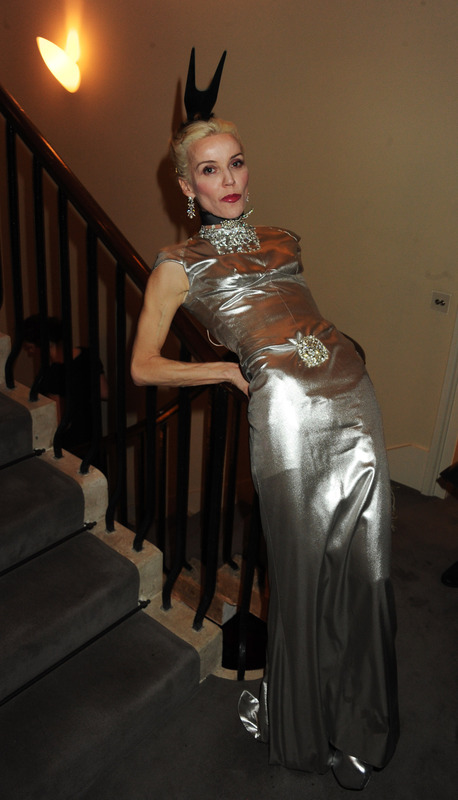 Another captivating invitee was the equally riveting Irish, French beauty, fashion icon, and “mécène des arts” à Londres – Daphne Guinness. She, with the platinum-blonde hair, pulled back to show off an exquisitely chiselled face, magnificent cheekbones – high as the peaks of Kilimanjaro, and expressive, huge eyes – Divine. She was swathed in a stunning sheath of silver, poured over her svelte, slim figure – the effect was a modern-day “Cléopâtre, reine d’Egypte”, who seduced Mark Anthony. However, Daphne is a blonde “Cléopâtre”, who could seduce Bernard-Henri Lévy – perhaps… Since she was quoted as saying – “He is quite obviously the love of my life”. There were also many other celebrities… the actress Kirstin Dunst (who played the role of “Marie Antoinette” in Sofia Coppola’s film), fashion designer Stella McCartney, model and socialite Alice Dellal, and the well-known artist Damien Hirst, as well as the music producer and DJ Mark Ronson, were also partying the night away till the early hours.